Happy Friday, friends-- the weekend is finally here! Now that we finally have a place of our own (that we own) we decided it was time to pony up some money for real furniture. There were a few things that we were dying to upgrade: our dining set and bed (which were both remnants of my first post-college apartment), in particular. Alex did a fabulous job of assembling our new dining table and even found a use for his jigsaw: breaking down boxes. I'm really in love with our new dining set. Alex was all about a farm table with benches and I wanted metal bistro chairs, so we met in the middle and I love how it came together. It's a little modern, but still a bit traditional and a little industrial, but still warm. And now I can finally host a dinner party for more than 4 people! We ordered a new bed a few weeks before moving in only to find out it would take about 2 months for it to be delivered. So, we spent the first few weeks in our new place sleeping on a mattress on the floor-- including one night camping out on the floor in our living room after the bed was delivered, but before the new mattress arrived. It was all worth it though, because our new bed is amazing and I have been sleeping like a baby. Some day I will get around to taking a photo of the bed in its complete and styled state. In the meantime, here's our work in progress bedroom. My wonderful perfectionist husband started hanging up our art this past weekend. Once things are up on the wall, I feel like a place really starts to feel like home, don't you think? He really hates this job so he was rewarded in cocktails-- from our new bar! It's not so much new, but our old console table (that doesn't fit in our new entryway) re-purposed into a bar in our dining area. 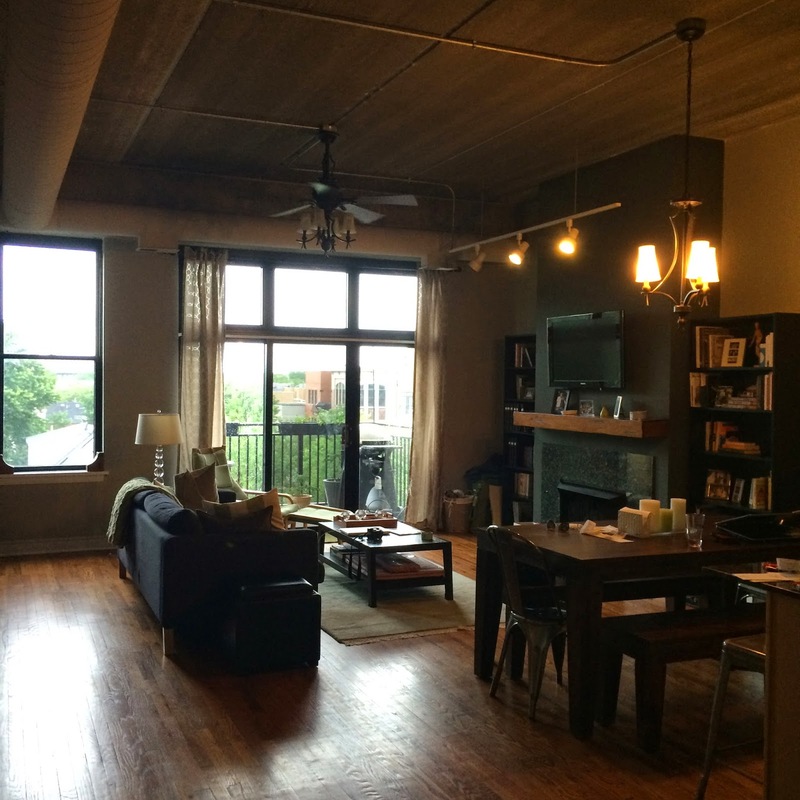 Here's a shot of our mostly complete living room. There are still a few things that need to be done, but this came together pretty quickly. I'm loving it so far and it already feels like home. Let's take a few minutes to get real now: For as well as the living area has come together, this is the current state of our second bedroom. 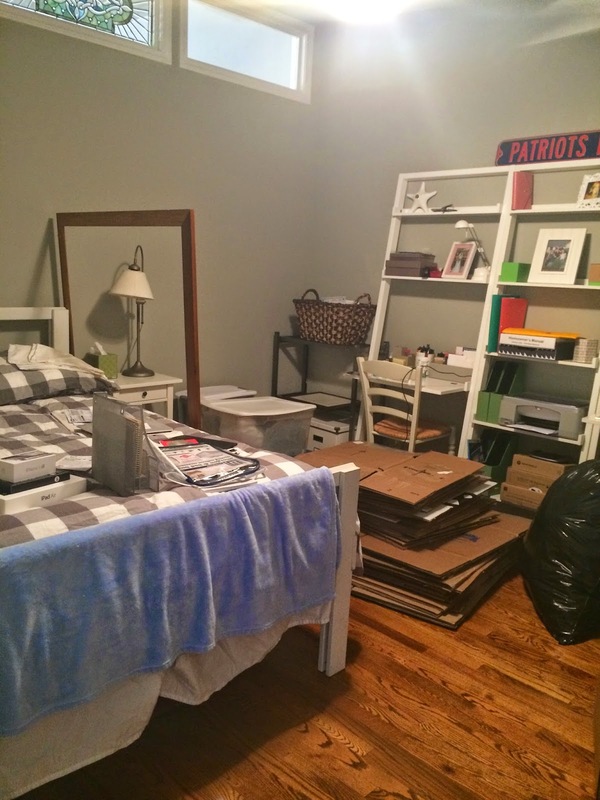 It's a full on disaster filled with packing materials, storage containers filled with miscellaneous items, and a few basic bedroom items, but not nearly enough to classify it as a suitable guest room, office, or combination of the two. This room is my next big project. And while we're talking about getting real, let's talk about cleaning. 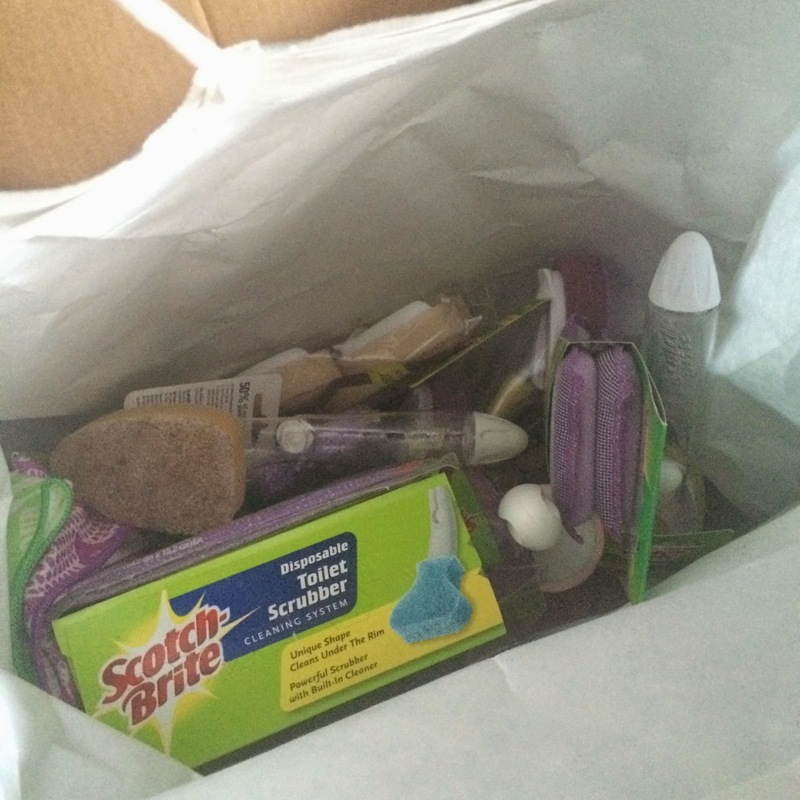 The great people at Scotch-Brite heard that I was moving and sent over a little housewarming gift filled with tons of great cleaning products to use as we got settled in. They have a wide variety of household cleaning items available and I was so pleased to see how many of them were reusable or made of natural and green materials. I was especially happy to see that big box of toilet scrubbers since I may or may not have left our toilet brush behind in our old place. Yes, toilet scrubbers are exciting. #homeowner problems. But for real, the microfiber dish & dusting cloth is amazing. We didn't have a lot of cabinets in our old kitchen so many of my dishes and appliances sat up on top of the cabinets exposed and collecting a nice thick layer of dust. It was so great to be able to give them a thorough dusting and cleaning before they found a real home in my new cabinets. Old apartment dust was not something I planned on bringing with me to the new place! This cloth collected the dust and residue from my dishes super quickly and without spreading it all over my kitchen-- it stayed on the cloth. It's also a washable and reusable cloth that can be used for up to 100 washes. Not bad. And then the grillmaster decided that it was time to give our grill some much needed attention. He did some research and figured out how to clean the grill grates naturally with lemons and salt (love!) and then grabbed a Scotch-Brite Heavy Duty Scrub Sponge to attack the outside. We aren't great about remembering to cover the grill up in the summer (since we use it a few times a week), so you can imagine that with the windy and rainy summer we have had and with the dirt that comes with city living, the grill was not looking great. It's sparkling now though. Thanks, Scotch-Brite (and Alex too)! Editor's Note: Scotch-Brite products were provided to me at no cost. The opinions expressed here, as always, are my own. 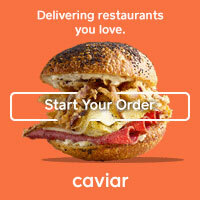 Your place looks great! Love your bed frame and bedroom rug! 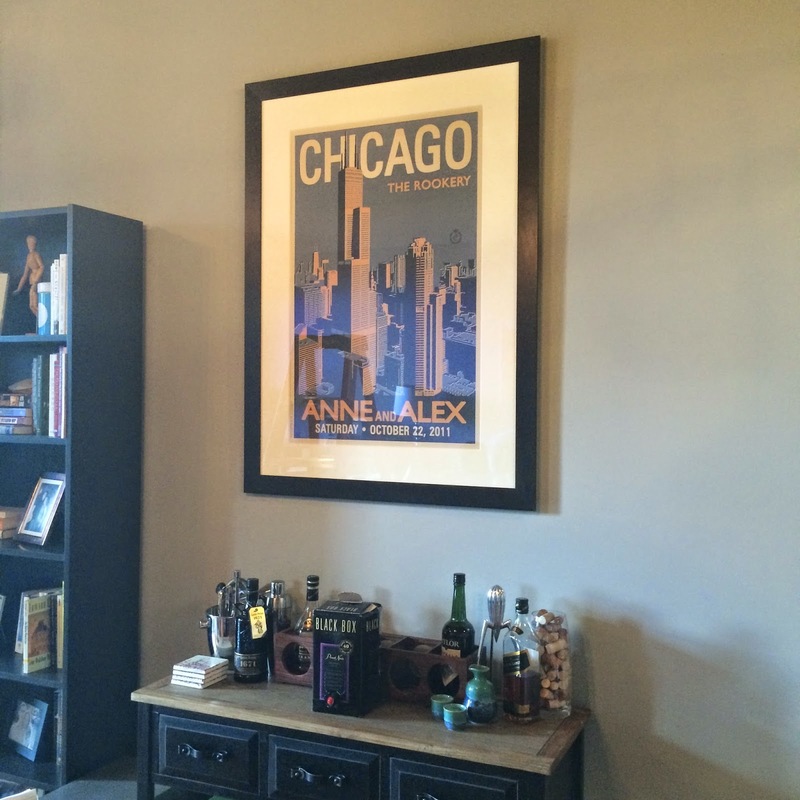 Where did you order your custom Chicago print in your bedroom? Love that! Thanks! It's from Alexander & Co. They sell them at Smitten Boutique on West Madison.